One of the most popular Korean dishes during the summer is Naeng–Myeon. It’s because this cold noodle dish is just perfect to cool down our bodies from Summer heat and it’s light enough but still a satisfying meal. Naeng–Myeon means literally cold noodles in Korean and it comes with multiple variations and styles. Most Naeng–Myeon noodles are made from flour and starch of buckwheat, potatoes and sweet potatoes. Traditional Mul Naeng–Myeon can come in a tangy iced broth made from beef, chicken or Dong-chimi (a cold kimchi broth with various vegetables). Talk about selections. Along with the cold broth and noodles, there are julienne cucumbers, slices of Korean pears, pickled radishes, a boiled egg and slices of cold boiled beef. 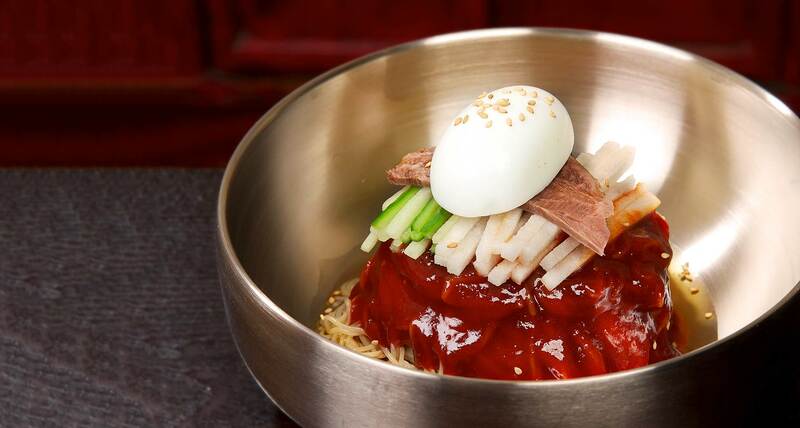 The other most popular variety of Naengmyun is Bibim Naengmyun which is served with Korean red chili paste and other ingredients. All of this is served in a large stainless bowl to help keep it cold, and spicy mustard and vinegar can be added to taste. It’s origin dates back to the Joseon Dynasty from 1392 to 1897 and became very popular all over Korea since then. It’s very popular to combine Korean BBQ meats with this cold dish: enjoy a refreshing bowl of Naeng–Myeon followed by Korean BBQ. Your taste buds will thank you and you’ll feel satisfied! Another nice, fresh, & tangy Korean menu which goes well with this glorious Summer season! You can enjoy this at SURA Korean Cuisine!